Hello Woodworking & Woodturning World! 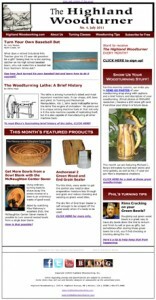 The July issue of the Highland Woodturner just went out, and this month we’ve got ALL NEW articles, product deals and great woodturning information. If you’ve ever looked at a baseball bat and wondered how you could make your own, wonder no longer – we’ve got an article from one of our readers on how he turned his own baseball bat, and it offers steps so you can do it too! We’ve also got a fascinating history of the woodworking lathe by former Highland staffer Elena Vega, as well as some really cool turned pieces by Michael C. Borg and another great woodturning tip from Phil Colson about keeping green bowl rims from cracking. Take a look at all of this and some great new products, and ENJOY! baseball bats? That’s cool. As simple as it may seem, but i’ve wondered how the curvy shape is atained with great perfection. Constructing something geometrical is always straight foward but for organic shape really takes the skills to another level. Cheers! I look forward to every issue of the Highland Woodturner! Thanks for another batch of great articles, ideas, how-to’s, & infinite inspiration! 🙂 ~Blog Subscriber, Facebook Fan, Twitter Follower, YouTube Subscriber, Customer, and Overall Proud Woodworker! Near Atlanta? One Day In-Store Sale at Highland Woodworking Tomorrow! Last Days of the Stanley Sweetheart Giveaway: Enter Now!